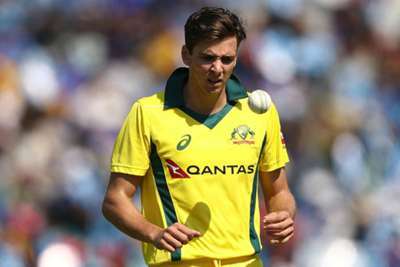 Australia paceman Jhye Richardson suffered a dislocated right shoulder during the second one-day international against Pakistan on Sunday. Richardson landed awkwardly on his bowling arm when attempting to prevent a boundary in Sharjah. The 22-year-old, who had taken two early wickets, watched the remainder of Pakistan's innings with a brace on his arm and it remains to be seen whether he will play any further part in the series. Richardson's injury comes just two months before the Cricket World Cup gets under way, so Australia will hope he does not face a lengthy absence. The quick took 2-16 from five overs before his participation was ended, with Pakistan going on to post 284-7 courtesy of a maiden international century for Mohammad Rizwan (115) and a brisk 60 from captain Shoaib Malik. Meanwhile, Pakistan have announced they will rest Faheem Ashraf for the remainder of the series to ensure he is fresh for the World Cup in England.